Meredith from One Sheepish Girl hosted another group yarn bombing event this weekend, which she dubbed a Sheepish Bloom Drop. 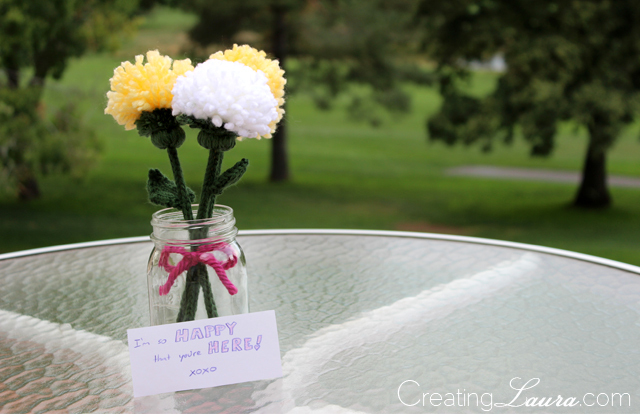 The assignment was to "knit, crochet, sew, stitch, or fold a flower creation and leave it somewhere out in the world." I've participated in her other group yarn bombings (remember the leaves and the hearts? ), so of course I wanted to join in on this one as well. 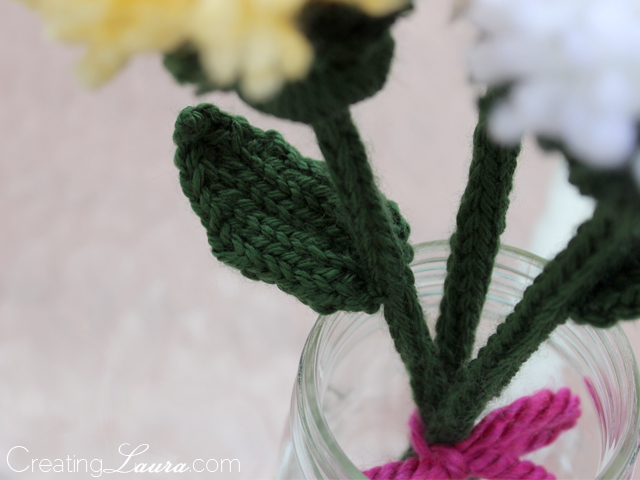 For my contribution to the Bloom Drop, I knitted a 3-flower bouquet. I made the stems by knitting i-cords around some skewers that I found in my parents' kitchen, and I attached a couple of leaves to the i-cords to make the stems look more believable. 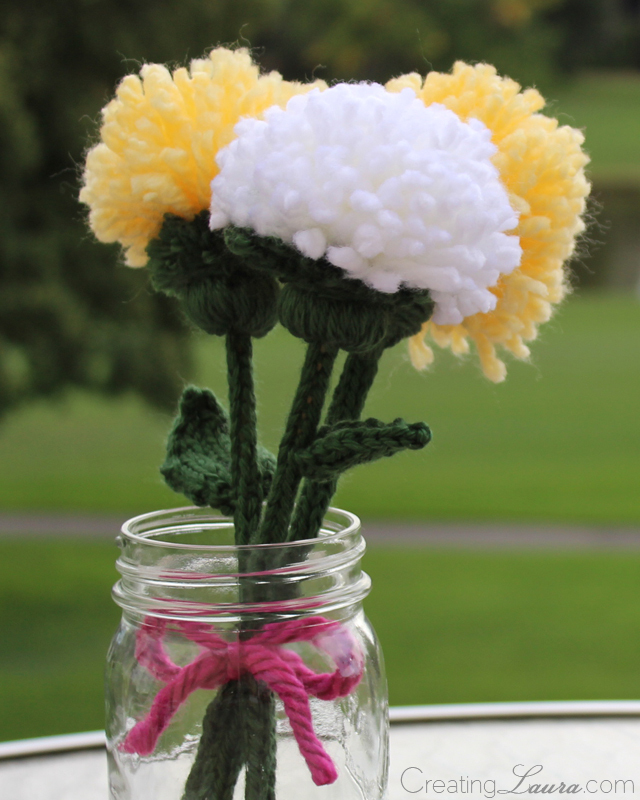 Then I whipped up some yellow and white pom poms for the blooms themselves, and some green half pom poms to go between the blooms and their stems. As you can tell, my love affair with my pom pom maker is still as strong as ever! In addition to the Bloom Drop, this weekend also marks the return of my boyfriend, who's been out of town for a week, so I decided to combine the two occasions and give my Bloom Drop creation to him as a welcome back gift. Did you participate in the Bloom Drop as well? Or have you done some other forms of yarn bombing? I'd love to hear about your experiences. This is such a great idea,and these look awesome! I have never heard of group yarn bombings across the world before I will have to look out for one to take part in, they sound so fun! They are super fun. It's nice to feel like you're a part of something bigger than just you; you know what I mean? Hi! 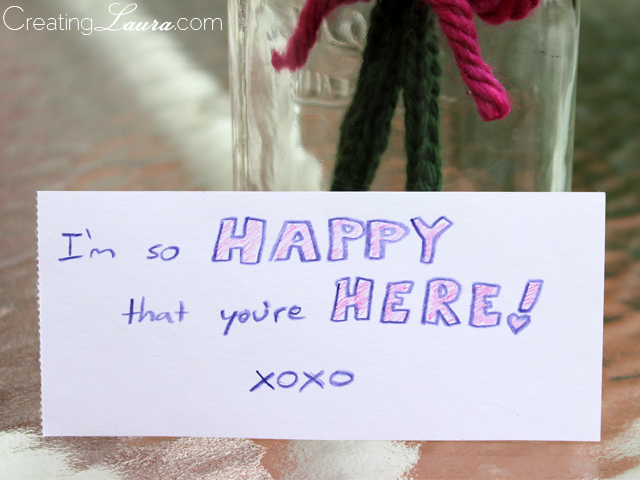 I found your blog through fabric bliss and love it! I'm new to denver and have trying to find a knitting group to join, you wouldn't happen to know of any? I'm doing the yarn crawl next week and I'm so excited! Hi! Isn't Denver great? I love it here. I'm usually only here for a couple months out of the year, though, because I travel for my job, so I don't know of any knitting groups. I'm sorry; I really wish I could help. Have fun on the yarn crawl! Aw these are so cool! I was planning on taking part in the sheepish yarn bloom but sadly forgot all about it! Oh no! Hopefully you can participate in the next one.